The Honeywell Voyager 1452g is flexible in all respects and grows with your requirements. When using the standard version of the Bluetooth imager it just reads 1D barcodes omni-directionally. However, thanks to its flexible licensing system, you easily upgrade it into a 2D and PDF area imager. Thus, you only need one device type, which you then equip according to your individual needs. If 2D barcode capture is not currently an issue, yet is conceivable for the future, then the 1452g is the right choice, and will not strain your budget. Connect the scanner to the host system via USB, keyboard wedge, RS232 or IBM. It communicates wirelessly via Bluetooth (2.4 to 2.5 GHz) with the charging and transmission station. 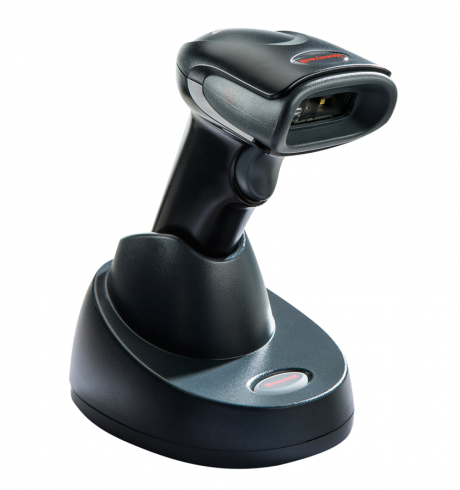 With a single battery charge work up to 14 hours with a scan volume of up to 40,000 barcodes. The batteries are fully recharged in approximately four and a half hours. A minimal weight of 210 g and dimensions of 62 x 173 x 82 mm (L x W x H) make the scanner a really handy worker’s companion.